Vinyl adhesive masks with printed camouflage and painting guide. The mask set reviewed here appears not to have reached stockists yet, but comparable AML masks are listed with the above two stockists for £3.08 and €5.42 respectively. Good quality and will simplify obtaining an accurate camouflage pattern outline. A useful aid to achieving a convincing representation of the “A” pattern camouflage on early model Spitfires - Recommended. The masks come supplied in a small zip-lock plastic bag with a coloured header and folded A-5 instructions. The vinyl masks are self adhesive. 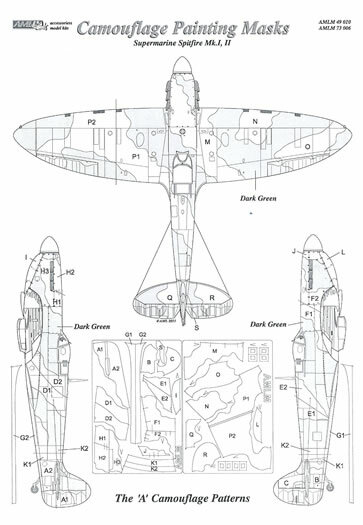 The instructions provide a useful plan and two profile views of a Spitfire Mk I/II. These plans are keyed to a diagram of the various mask pieces showing where each should be located on the model. The quality of the masks and diagrammatic presentation seems very good. I did notice however that the header slip states that the contents are 1/48 scale whereas they are clearly 1/72. I find that getting a really faithful outline of British camouflage patterns in 1/72-scale is harder than might be assumed, whether using Blue-tac sausages, masking tape, or paper masks cut from photo-copied plans. I can see considerable potential for sets such as this, especially if you are going to do a series of the same aircraft wearing the same pattern camouflage. I have yet to try using these masks. However, I have experienced some problems with getting other brand vinyl canopy masks to adhere well around some tightly curved surfaces. But AML’s camouflage masks have generally large surface areas so it may not be a problem, especially as most curves are gentler than those found on canopies. Besides, any areas that may lift could easily be assisted with Blue-tac or similar agent without compromising the finish. 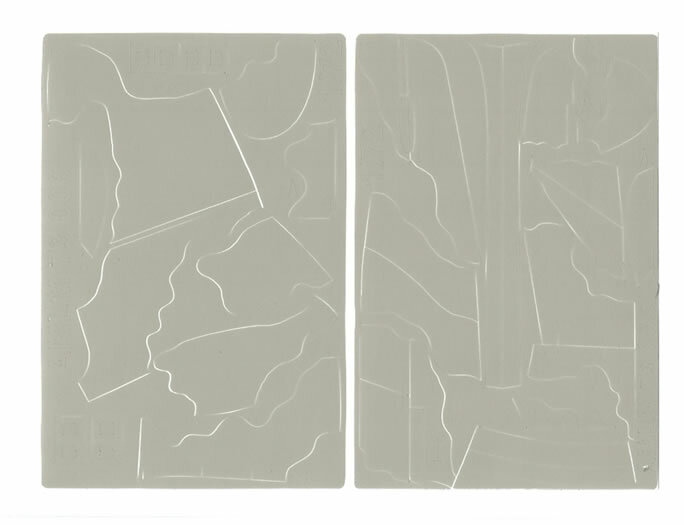 In fact I would think that they could be used more or less repeatedly, even after losing their tackiness, by using Blue-tac etc to locate them as you would paper masks. 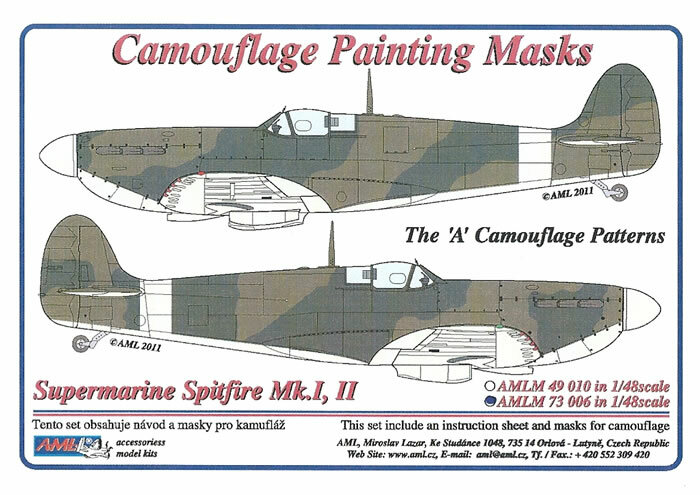 AML make camouflage masks in 1/72, 1/48 and 1/32 scales. Upon checking their range I saw that they offered both “A” and “B” patterns for their Spitfire MK V camouflage masks, but as yet have not listed a “B” pattern for the Spitfire Mk I/II at the time of writing (I assume that both camouflage patterns were used on the first two marks of Spitfire). This camouflage mask set is well produced with a useful pattern guide. This kind of camouflage mask is potentially very useful, even if it reduces some the skill required and challenge when replicating the intended colour scheme. I would assume that repeated use should be possible provided an alternative system for adhering the masks is used once the product’s tackiness is lost - Recommended. Thanks to AML for the review sample.